In February 2012 Rock Around The Blockade activists travelled to Cuba as part of a solidarity brigade calling for ‘Justice For The Cuban Five!’ who remain prisoners of US imperialism. Cuba opened our eyes and ears to the true meaning of popular democracy and community organising. Over the two weeks we came to learn that the social, economic and political alienation engendered in imperialist Britain is only natural under the exploitative capitalist system; and not in life itself. Cuban Socialism has destroyed the violence and inequality that was once aimed at the poor in Cuba, replacing it with a social solidarity which promotes inclusion and empowerment. In comparison to Britain, where you essentially cross a box once every four years then hand over your power to MP’s and political parties who do whatever they want, Cuba’s system is based on popular participation. Cuban democracy is found not only in a ballot box but in the schools, communities, workplaces and parliamentary institutions. Genuine changes are consistently being debated and implemented in order to defend and improve the democratic structures currently in place. On a visit to ‘The Republic of Angola’ primary school in Havana city, we saw the participatory democracy practiced by the Pioneers[i] of Jose Marti, an organisation which exists throughout primary schools in Cuba. We were amazed by the maturity, education and discipline of the young revolutionaries. Pioneers elect their own pupil representatives, from the age of six, who are responsible for raising and addressing issues affecting Pioneers inside their schools. In addition Pioneer delegations meet with nationally elected adult political representatives to identify improvements and changes needed in the education system. From primary school, young people are taught to believe in their own and their fellow pupils capacity to aim for and achieve success. Such a world class education system, for the children of workers, is only possible in a country defending and building socialism. We found this participative and democratic approach throughout the communities we visited. A meeting with representatives of the Federation of Cuban Woman (FMC) and the Talleres de Transformacion community centre helped us to understand the difficulties faced in making sure young and old, men and women of all backgrounds are supported and integrated into the heart of the community. Our brigade attended a meeting with over thirty members of a local Committee for the Defence of The Revolution (CDR), which is essentially a committee for the welfare of the neighborhood. The CDR structure was established in September 1960 to promote vigilance and defence against imperialism’s internal campaigns of counter revolution. The CDR slogan reflects this, 'Con la guardia en alto', which translates as 'at the forefront is safety'. CDRs are the smallest democratic unit in Cuba with each committee consisting of sixty to a hundred residents. Membership is voluntary and open to all residents over the age of 14 years. Nationally 88% of Cuban people are in the CDRs. They meet a minimum of once every three months to plan the running of the community; including the organisation of public health campaigns to promote good health and prevent disease; the upkeep of the area in terms of waste and recycling; the running of voluntary work brigades and providing the adequate support to members of the community who are in need of help (for example in the case of domestic disputes etc). The CDR’s discuss nation wide issues and legislation and crucially, feed back their proposals to the National Assembly and other organs of popular democracy. Essentially the CDR’s deal with the bread and butter issues which the working class in Britain can only dream about having a say in. 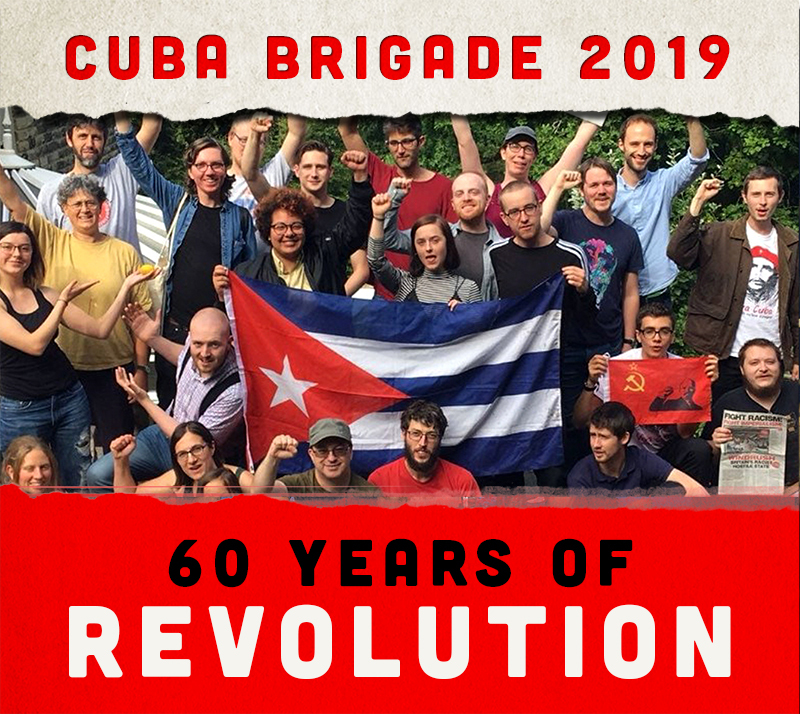 Although only one person of the group of residents we met was a member of the Communist Party of Cuba (PCC) everyone present; of different ages and occupations; identified themselves as revolutionaries fighting for a better world. Participatory democracy is also transmitted into the workplace as Manuel Montero of the Cuban Workers Confederation (CTC) described to us. The CTC is organised across 18 occupational sectors holding 3.4million members, with the aim of involving Cuban workers to have input in directing their society. While membership is voluntary, workers who do not join up enjoy the same work place rights as union members. Manuel Montero explained that membership payments to the union are voluntary and organised within each workplace. This helps to protecting members democratic rights as if the workers feel they haven’t been represented adequately they can withdraw or reduce the amount they pay to the union while remaining union members. Furthermore CTC officials are elected by the workers and continue earning the wage they received before being elected or the median wage of workers depending on the level of responsibility held. The General Secretary of the CTC, who only earns a small amount above the median wage of workers[ii], can hold office for no longer then 2 terms of 5 years and the CTC has a conference every 5 years. Like all political representatives of the Cuban people these officials are subject to the right of recall if the majority of the workers see fit. Describing the state repression meted out against trade unionists before the revolution, Montero pointed out how this contrasted with today’s situation where ‘any law presented to the National Assembly has to be discussed with the CTC first.’ For example the CTC led a survey of 8 million Cubans to discuss and identify any potential violations of workers rights resulting from new guidelines to update the Cuban economy. The guidelines include the redeployment of 500,000 people from unproductive areas of the state sector to cooperatives and self-employment, setting out self-employment as a legal activity with union representation. The CTC then fed-back proposals and concerns to the Cuban Communist Party (PCC) the body which formulated the guidelines. The feedback from the CTC was in addition to proposals from CDR’s, municipal and provincial assemblies, and organisations across the nation. It is testament to the democratic values and sincerity of Cuba’s revolutionaries that after these national consultations, 80% of guidelines were changed to reflect the views of the Cuban people. This was not just a rubber stamping exercise. There are 3 levels of power in Cuba: Municipalities, the Provincial Assemblies and the National Assembly. Municipal elections for Popular Power are held every two and half years and Provincial and National elections every five years. All people from the age of 16 can vote and all people from the age of 18 can be elected. There are no restrictions along race, religion or gender. A candidate must be nominated by their community to stand for election (accepting the nomination is voluntary); they cannot simply decide to stand. The Cuban constitution forbids nominated candidates campaigning for election. This protects voters against the potential for deception and manipulation. The photographs and a short biography of the candidates are put in public places so people can read about them and decide who is best qualified and suited to the job. The elections take place on a Sunday, 6am-6pm, and the candidate who has 51% of the votes is elected a delegate to the municipal assembly. The counting of the votes is done by the Pioneers of the locals schools who also guard the voting boxes. The votes are counted in front of the entire neighbourhood. The elected representatives must live in the area they are elected to represent, if they move municipalities they have to change their job. There is no financial or material incentive to enter into politics in Cuba. The elected representatives continue with their normal lives and jobs, receiving the same salaries they were earning before being elected. At a certain level the person may have to give up their job in view of the responsibilities they hold. The delegates meet every six months with their electorate to render account of their work and discuss problems. If a citizen wants to meet a delegate outside of this time they can do so at short notice and the delegate must respond quickly. The electorate have the right to recall any delegates they are unhappy with by a simple majority vote meaning that new elections have to be organised. The same process is repeated at Provincial and National level and all votes are direct and secret. It is important to note that both Fidel and Raul Castro go through the same process of election as all other candidates. Contrary to the claims of the multinational media, Raul Castro was not ‘handed power’ to become President of the Council of State by his brother Fidel Castro after he took ill, but was elected through direct secret vote, both in his neighbourhood and in the National Assembly. Osmani Castro summed up the spirit of the political and parliamentary system in Cuba by stating that the ‘elections in Cuba are not a fight between politicians or political parties; they are a choice between the best comrades.’ He also outlined the depth of discussion that was held nationally over the updates to the Cuban economy stating that ‘most people are likely to have discussed the proposed guidelines several times over in different organisations and groups they are a part of.’ Osmani was clear that the guidelines are ‘not a finished process’ and therefore ‘changes are still being made’ following debate, implementation and evaluation. This air of caution mixed with a steel determination to overcome Cuba’s obstacles in building and defending socialism was an attitude we saw in the majority of Cubans we met. It was pointed out on many occasions that democratic participation is key, that is to say without the knowledge, backing and spirit of the Cuban masses, progress will not be made. We were greatly inspired by these visits and meetings in Cuba and now back in Britain, in the wake of the May 2012 local elections where less than a third of registered voters participated, our experiences of Cuba’s socialist democracy seem even more powerful. In contrast to the sham of British democracy the island of Cuba most often records voter turnouts of over 90%[iii]. That the British working class shows no interest in parliamentary politics is neither surprising nor disappointing. Indeed it is encouraging that the majority of people see through the daily hullabaloo of ruling class puppets, clowns and hirelings. However knowledge without action is useless and we will only learn what is possible in this world if we join the struggle for socialism; sobre la marcha as the Cubans say. Britain’s working class now have to prepare and get organised for the fight. I’d urge everyone to look to Cuba for inspiration and the example that there truly is only one possible alternative to the sorry life that awaits the present and coming generations – the defeat of capitalism and the victory of socialism. The revolutionary spirit embodied in the famous words of the Irish Republican hunger striker Bobby Sands that ‘everyone has their own particular part to play. No part is too great or too small; no one is too old or too young to do something...’ is given life in Cuba. Now is the time to spread that revolutionary spirit within the shores of Imperialist Britain. All Power To The People! Seize The Time! [ii] For example, the median wage of people in Havana is 425mn (Cuban pesos). The CTC officials get paid 450mn and the general secretary gets paid 550mn. This is much lower than can be earned in the tourist trade.